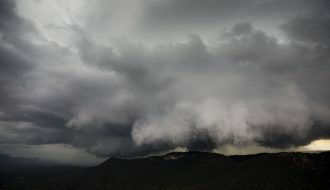 Saturday afternoon, I concentrated a local storm chase around the Windsor / Richmond / Penrith and Lower Blue Mountains area. 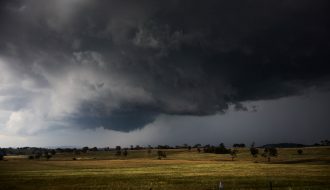 I decided not to target the southern tablelands but instead the lower Blue Mountains only because I had few storm photos of this area for this season and I was eager to do some storm chasing / photography of this region. I also wanted to target another region. 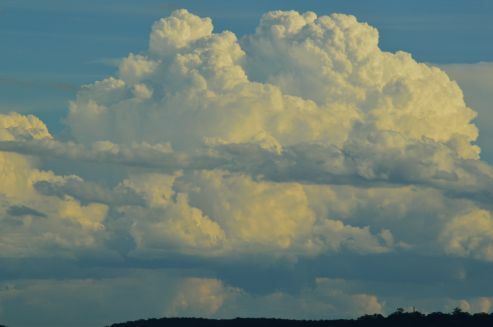 Initially a storm developed in the Lower Blue Mountains and I went out to investigate it only to see that one split then later weaken as it moved north east towards bushland. Another cell developed close by which included a strong updraft tower but this soon became outflow dominant. I was in contact with Colin and he was near Penrith. 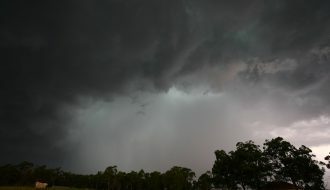 A much stronger storm was evident to the south west and I slowly made my way to where Colin was near Penrith on Castlereagh Road to watch it develop. 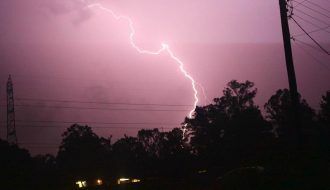 This storm became the focus of my photography and it warranted closer viewing. 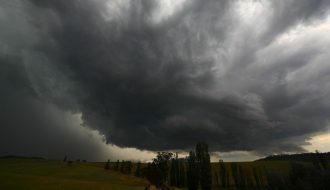 The storm produced a very interesting base and I took a number of photos to show how it developed. Eventually the storm became outflow dominant but I had captured its sequence including a lowered base that split into two bases. That storm continued for a while but was focussed in bushland area north of the Great Western Hwy but south of the Bells Line of Road. The storm kept producing interesting structure as it waxed and waned throughout its life cycle before decaying late in the day. 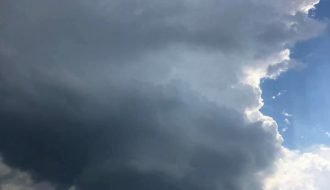 While this was occurring, the major storm of the day was certainly visible which was not too far away to the south and south east. Images were taken of that storm while Colin and I were watching the storm close to us. Late afternoon, we left the area. 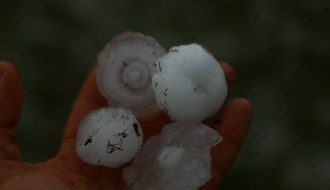 I understand Colin went south and I went over to Bella Vista to watch the northernmost supercell slowly decay. The storm that was targetted produced this base which was solid but slightly separate from the parent storm. The base then splits into two bases which I did not expect. 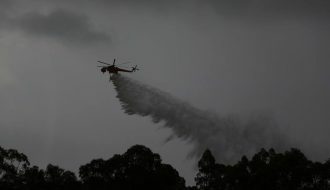 Following the split, it rained itself out but the sequence of the split was captured. While this was occurring, the major storm of the day was visible to the south and south east as shown. A second image. Keep in mind we could have targetted this but decided to stay onto the storm very close to us. The storm close to us then produced this structure before slowly decaying but it was worth watching to see what happened to it. To the south, a new short lived storm developed to the west of the main storm cell. This was short lived but the cloud towers were interesting. We both left the area following these shots. It was also clear by this stage that the storms to the SE were dominating. I returned to Bella Vista where I watched the northernmost storm decay.